While traveling in May I had a book situated in my bedside stand for some time that I finally got around to. 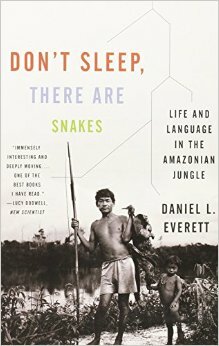 Don’t Sleep, There Are Snakes by Daniel L. Everett is one part sociology text, one part linguistics text, and one part personal memoir. Moving with his family to be missionaries to the Pirahã (pronounced pee-da-HAN) Indians in the Amazon in the late 70’s, Everett would begin a 30-year journey. He would discover a people whose language was daunting, and completely “other” to Western thinking. Not only tonal he encountered that Pirahã language had no words for color, past or future tense and other anomalies. He discovered a communal community that lives entirely in the moment who loves to joke and that is resilient in having no desire to “modernize” in any sense of the word. In the process of living and learning from the Pirahã Everett became an atheist. 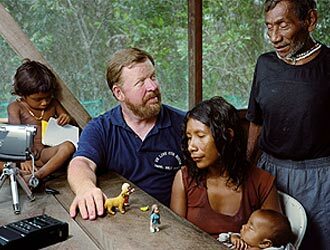 Daniel L. Everett and the Piraha people. According to Sapir, our language affects how we perceive things. In his view, what we see and hear in our day-to-day existence results from the way we talk about the world… Sapir even goes so far as to claim that our view of the world is constructed by our languages, and there is no “real world” that we can actually perceive without the filter of language telling us what we are seeing and what it means. Everett looses his faith in the process of working with the Pirahã, which honestly reading his account seems very reasonable. The Pirahã don’t want or need to be “saved” from anything. They are entirely about present experiences. Everett points out with a clear eye the good he sees Christians do as when they save his wife and child’s life “I have never known kinder people in all my life. I suspect I never will.” And he points out the ill Christians do as when talking about the Colarios, ostensibly evangelical Christians of the Assembly of God denomination who would cheat the Pirahãs in trading. Makes me think of the C.S. Lewis quote that Christians are the best and worst witness for Christ. In my heart, Everett story came across as painful as clearly he lost his family in the process, and his lack of words on the topic seemed to reflect that those wounds may be tender. It was then too I noticed that there are no photos of them in the book. I would like to hear his wife Keren and his children’s perspective and story as they lived with the same people but seem to have come to a different conclusion. 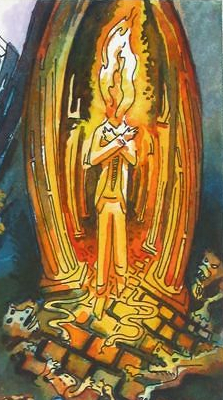 This entry was posted in A good read and tagged Daniel L. Everett, Don't Sleep There Are Snakes, friendship and language, Language Box, limits of language, Loosing Faith, Loosing God, The Liturgists podcast. Bookmark the permalink. I really enjoyed reading your analysis of this book. In my limited interactions with indigenous culture (and really, just living in a cross-culture environment) for the past few years) I’ve come to view most evangelistic efforts with deep unease. So much of our western colonialist tendencies get emsheshed with our efforts to convert people. I feel like I can really identify with some of the conclusions the author made. Also, I started listening the The Litergists podcast (per your recommendation, actually) and those specific episodes you mentioned, were incredibly profound for me. I would like to listen to the podcast. I have heard of Everett before, but haven’t read his book. I’m always a little suspicious of people who idealize “primitive” tribes- there is so much suffering in the jungle and often a desire to have access to modern medicine and technology, and it isn’t right to deny that to people, either. Language certainly is powerful, though. Great post, Tim. I’ve thinking a lot the last few years about how language shapes our reality, especially in relation to our understanding of God. So long as we refer to God as “Him,” “King,” “Father,” etc., this shapes the reality of who we see God to be, and also the relationship of our selves to God. If we are ALL created in the image of God, female and male, isn’t it limiting to use male-only pronouns in writing about God? But to suggest using more expansive gender language about God is really threatening to folks, really jarring. At any rate, would love to talk with you more about this sometime! Melanie- I think about this. The Episcopal church- some of them, anyway, use other terms for God in some prayers. I tell myself it is our limited capacity for understanding God that makes us have to speak of Him/Her in gendered terms. Really enjoyed this one, Tim. I agree with Sapir and Worf that we can’t escape the “language box,” but I do note that translation is possible.